It’s an appropriate thought as we look at negotiations between the Iran regime and the P5+1 group of nations wrestling with how to keep Iran from possessing nuclear weapons, but if that issue is really just a tangent of an ever greater problem facing the world today which is the recalcitrant and predatory nature of the regime’s mullah leadership. Jefferson was right thought in 1774 and his words apply today because the claim of authority assumed by Iran’s mullahs was forcibly wrested away from the Iranian people in the 1979 revolution and subverted into the perverse extremist theocracy it has become now. All of which makes what Trita Parsi, leader of the regime’s chief lobbying group, the National Iranian American Council, wrote in National Interest patently absurd and indicative of how craven Parsi has become in shilling for the mullahs. “But the necessity to uphold dignity is at the very center of both the problems and the solutions in the ongoing nuclear negotiations,” Parsi said. Parsi’s contention that affording Iran’s mullahs “dignity” is the clear path an agreement. He equates this by using the example of the demands by the P5+1 to allow inspections of regime military sites in order to ascertain if Iran has militarized its nuclear development and whether or not the U.S. would allow similar inspections of its military bases under similar circumstances. It’s an absurd proposition on Parsi’s part for two significant reasons: 1) Mullahs in Iran and not the U.S. was violating international agreements it had signed to not develop nuclear weapons; and 2) Under nuclear treaties with the Soviet Union and later Russia, the U.S. allowed access to its nuclear bases and facilities for international monitors and Soviet and Russian personnel to witness the dismantling of warheads and missiles. Parsi also takes exception to the idea of “anytime, anywhere” inspections, blaming that condition for offending Iranian dignity and precipitating a crisis in talks. He further suggests that Iran has always given inspectors access and has no problem with it if it was delivered in a manner preserving of Iranian dignity. I give Parsi credit for his imagination. He might make a good fantasy writer some day with these fairy tales he concocts, but the truth of the situation is that the regime has repeatedly halted inspections, cutting locks off of monitoring lockers and removing inspection cameras. In fact, the regime still to this day has refused answering questions in a dozen areas raised by the International Atomic Energy Agency over the military dimensions of Iran’s nuclear program. Far from preserving Iranian dignity, Ali Khamenei and his fellow mullahs have refused these questions and concessions not out some sense of national pride, but rather from the very real fear their military secrets would be discovered and the entire false façade they had constructed of a peaceful nuclear program would come crashing down. Remember, the regime had hidden even the existence of secret nuclear facilities at Parchin, Natanz and Arak. The fact that Khamenei himself has posted his own definitive red lines where he will brook no compromise renders Parsi’s arguments moot since the regime’s top mullah has taken upon himself to repudiate Parsi’s claims over and over again. 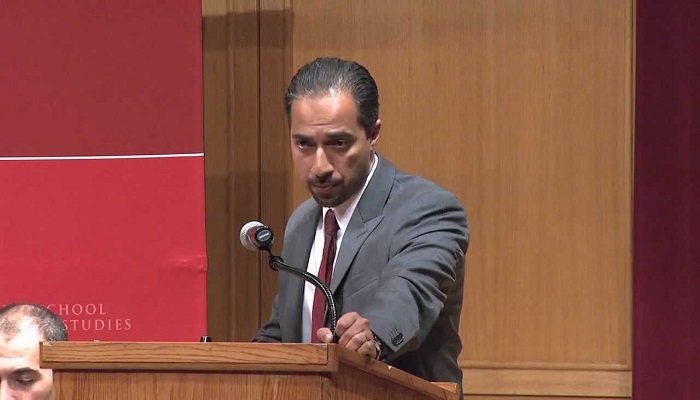 Why does Parsi discuss Iranian dignity when he never deals with the primary factor which is the regime is the violator of international law and agreements in the first place? Does the dignity of a murderer become important as part of his trial? Do a war criminal’s actions deserve dignity when being examined by prosecutors? The fact that Iran has been caught in criminal activities effectively negates its right to be treated as an equal amongst nations who abide by international law. China does not fund Hezbollah. France does not supply Houthi rebels with arms. The United Kingdom does not recruit Afghan mercenaries and send 15,000 of them to support the Assad regime in Syria, but the Iran regime does all these things and more. Instead of writing about the dignity of the regime’s mullahs, Parsi would do better about writing of the indignities being suffered by American hostages such as Jason Rezaian of the Washington Post, or the Iranian families whose loved ones have been hanged by the thousands by the mullahs. Parsi might consider the plight of the millions of Syrians, Iraqis, Yemens and Lebanonese who have been displaced as refugees fleeing the proxy wars Iran has started.